Eimuntas Nekrošius and his theatre company Meno Fortas present "Hamlet" as you've never seen it before. Nekrošius brings an aggressively physical, visual style to "Hamlet" that replaces preconceptions about how Shakespeare ought to be played with its own rules. To present a radically new version of such a familiar work that still brings out the complexities of the text is a major accomplishment that has duly been celebrated wherever the Meno Fortas "Hamlet" has appeared. We are fortunate that the World Stage Preview has brought such an important company to Toronto. "Hamlet" is the first work Nekrošius' troupe performed under the rubric Meno Fortas ("Fortress of Art"). Since its first performance in 1997, it has been seen at theatre festivals all over the world. In 1998 it was acclaimed as the best theatre production in Europe. What is so remarkable is that Nekrošius alters the conception of traditional western theatre that places the text foremost and dictates that nothing should attract attention from it. In a procedure more familiar from avant-garde opera productions and from eastern theatre like kabuki, Nekrošius creates a strong visual component that complements and comments on the text presented. This goes far beyond our idea of a "concept production" wherein, as happens too often, a director forces an idea onto a classic play. Rather Nekrošius' is an image-based production where the director has found interconnecting visual equivalents for the underlying questions and conflicts in the work that are played out simultaneously with the text. In this "Hamlet" Nekrošius has looked beyond the superficial level of plot and counterplot to find a deeper reason for Hamlet's melancholy and paralysis of will. As Jan Kott among others have noted, Hamlet is facing an existential crisis. Life has lost meaning and so has any action he might take. The meanings things once had no longer obtain. To symbolize this problem Nekrošius has designer Nadežda Gultiajeva suspend the rusted blade of a buzzsaw over the set for the entire action as a kind of sword of Damocles, demanding decision but offering destruction. At one point when the blade is dressed in the same coat the characters share, we see this problem lies not just outside people but within. Water, normally symbolic of life, here is associated with death. One only has to think of the death by poison of most of the major characters and Ophelia's death by drowning to realize where Nekrošius has derived this visual element that so dominates the play. There is a nearly constant drizzle over the buzzsaw blade and onto the stage throughout. The Ghost is first perceived embodied in this downpour. When the Ghost urges Hamlet to revenge he anoints Hamlet's hands and feet with water from a block of ice which when shattered contains a dagger. The Ghost hangs a lit candelabrum decorated with ice below the blade that, as a reminder of his death and death in general, Claudius destroys. 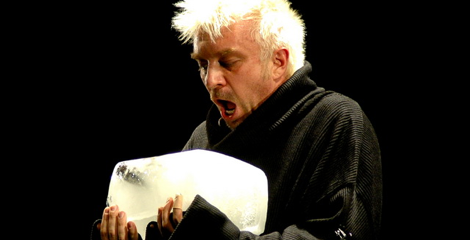 Hamlet murders Polonius hidden in a trunk by dipping his breathing tube into an oversized glass of water. Hamlet gives his first soliloquy ("O! that this too too solid flesh would melt, Thaw and resolve itself into a dew") under the central downpour and later delivers "To be or not to be" in a dissolvable shirt creating the striking image of a man whose flesh seems literally to be falling away from him as he speaks. The water imagery is only one of a fascinating series of concatenated images that reinforce Nekrošius' interpretation of the text. There also is fire and ash, pipes and tubes, the players as clowns, a stage on the stage and more. The visual components are highly inventive, but Nekrošius also interprets the play through more traditional means. What Hamlet sees as "rotten" in Denmark is its atmosphere of ongoing celebration as if forced mirth could drive away the omnipresence of death. Hamlet is so distraught at the beginning as to appear mad, but as the play progresses he gradually recovers, finally accepting a life without meaning. Nekrošius makes a point of having Hamlet seal a pact of friendship with Laertes in the grave scene so that the final swordfight becomes a symbol of the absurd game of life all must suffer--indeed the whole cast wield foils. Ophelia's madness seems to set in with Laertes' departure as if he were her only protection from the madness reigning in Denmark-again the whole cast urge her on. At the end the Ghost reappears to lament the death of his son as if this, in fact, is his eternal punishment. The production requires precision and physical stamina beyond the ordinary projection of a text. Indeed, Aleksas Churginas' prose translation permits a rapid-fire delivery that we would never countenance in Shakespeare's original verse. Nekrošius' casting of Lithuanian rock star Andrius Mamontovas as Hamlet might be considered a stunt if he were not also a fine actor. He shows us a young man who reacts to the world as if he were a child. Gradually he takes command of himself, reaching independence when he confronts Gertrude in the closet scene. He shows us a Hamlet, who, like Claudius, is filled with an intensity with no suitable outlet. While Claudius punishes others, Hamlet punishes himself until he sees the commonality between his own condition and that of humanity. Vytautas Rumšas is a dangerous Claudius, a loutish brute ready to explode at any moment. His anger fills the chapel scene, here presented in full. Unfortunately, the unvarying decibel level of his delivery becomes tiring. By contrast Dalia Zykuvienė-Storyk plays Gertrude as wholly passive, as if Gertrude had succumbed simply because Claudius was more aggressive than Old Hamlet. She is excellent in the closet scene when Hamlet confronts her not so much with her guilt as with the reality of death. The Laertes of Kęstutis Jakštas is a noble-minded fellow who earlier than most recognizes the good in his supposed enemy. With the Ghost of Vidas Petkevičius there is no question that he is Hamlet's father, not a demonic apparition, with knowledge as limited as anyone living. He does not merely set the revenge plot in motion but himself becomes a victim of it. The three other main characters are all given non-traditional interpretations. Nekrošius relates the play forward to "King Lear" by having Ramūnas Rudokas as Horatio appear not as the usual voice of reason but more as Lear's fool, able to comment and wishing to protect the central figure but afraid and unable to save him. Through costuming Hamlet and Horatio literally appear as two people in one coat, two sides of one person. Povilas Budrys is a much younger Polonius than usual, lithe and stealthy, but with many of his best-known lines cut becomes a minor figure. Nekrošius has the childlike Ophelia begin to go mad soon after Laertes' departure, a scene she continually recreates. This shifts blame away from Hamlet and onto the perverted world where she lives, but it means that Viktorija Kuodytė has little room to built a character. Many people will find the idea of watching a four-hour version of "Hamlet" in Lithuanian with English surtitles unappealing. The production could be more modulated and character development and interaction is often displaced into visual metaphors. But this one production contains more insights into Shakespeare than several seasons of the Stratford Festival taken together where visual interpretation consists merely of recostuming characters in different periods. The Meno Fortas "Hamlet" may not be perfect but it is challenging and invigorating. Nekrošius demands that the audience not simply watch the play but re-examine it. I found that the four hours flew by because Nekrošius' vision, by so fully engaging the senses, fully engaged the mind. Photo: Andrius Mamontovas. ©2009 Luis Meza.